Another 3 blog day! It is an illness! Actually, I just wanted to tell everyone that I just posted episode #17 of my podcast - Learning to Live With SD. This episode is a major shout out to the other SD bloggers I have met in my blogging "travels." I had speech therapy today - I used to have appointments every Wednesday but am down to only every other week. Anyway - I wanted to share with you. Susan (speech therapist extraordinaire!) said that my voice sounded the best it has ever sounded - the tone was good and it sounds "normal!" Did you catch that word - normal! She played me a recording from two weeks ago and then a recording I made today - what a difference! She was so excited! Needless to say - so was I! There was even talk of going to every three weeks and eventually once a month. Progress is being made! We had the same conversation we have had each appointment for the past several months - why is my voice doing so well? The answer is still "Who knows!" but, we both agree that my latest baby step of improvement is from the fact that I am becoming better able to "catch" my voice in a decline before it goes totally haywire. Then, after I notice my voice going down, I remediate with a much lower volume and more of the exercises - especially inhalation voicing. Did I tell you that I read totally on the inhale for about 5 minutes yesterday? Just wanted to see if I still could do it. Susan said that probably helped a lot to whip those darn muscles back into shape. Another HUGE contributing factor was the use of my Spokeman. I just love that darn thing! Even writing about it makes me think fondly of it! Using the microphone helped keep me from stressing my voice by pushing for volume and allowed me to slowly make progress while still being heard. I am so happy that I am doing well! Of course - I thought I was especially fine voice today but . . . I am always a bit nervous about going to Speech. Sometimes she sees things I don't - like pushing my voice too far. However, I am STARTING to get better about that! More exercises, massaging, and reading. Can't stop now! As you may know, I live in Dallas, Texas. Well - I live in the Dallas-Fort Worth Metroplex. What, you may ask, is a Metroplex? Good question! When Hubby and I moved to the Dallas area we were confronted with the Metroplex concept over and over and over. We were puzzled for a bit. Finally, we figured out that a Metroplex is basically a HUGE collection of cities in and around the two big cities of Dallas and Fort Worth. So - all the suburbs around the area - we are still not so sure how far the Metroplex reaches - are included in the Dallas-Fort Worth Metroplex. Anyway - my point is that while I live in Dallas, Texas, I live in the middle of a big, urban/suburban area with an astonishing number of very long and very high highway overpasses. A lot of people think that all of Texas is rural and crawling with cattle and cowboys. That isn't true. Yes, once in a while a "country boy" will drive into the "big city" in his pickup truck with his cowboy hat and you will see him driving around. However, that isn't a real common occurrence. And there are cattle here and there on empty tracts of land (BIG tracts of land) which are future shopping center sites. In Texas, if you use the land for agriculture, you get a really big property tax break - hence the cattle. If you drive out of the area for about 45 minutes or so you can start seeing real farms and ranches. Go a bit further and there you have the iconic Texas everyone thinks of - big stretches of ranch land with a house in the center. Horses and cows and stuff like that. I do like to imagine what life was like in our area in the past when it really WAS covered with cattle and cowboys on horses. On my way to sign language class last night I passed one of the few farm/ranches hanging on in the outskirts of Dallas. It is bisected by roads and bordered on one side by a major highway. Normally I might see some cattle hanging out and one or two calves romping around. Last night, however, I saw horses. Beautiful horses. They were in a small cluster under some trees and made such a lovely vignette. One horse actually broke away from the group for a short time and trotted around the field before returning to his group. In that moment as I was driving by I was transported back to when this entire area was filled with fields where horses ran free. I could almost see a cowboy sitting on his horse watching his herd of cattle as they slowly moved towards a new pasture. I felt like I saw history. Then, I was back to the real world of traffic and people who really don't know how to drive! I know, I know - 3 posts in one day is bordering on neurotic but I promise I have been away from the computer since my first posts. I am actually getting ready to head to my sign language class. There are only three classes left and two of those are test sessions! What will I do without my class to go to? It is really the only place that I socialize with people - true most of them are young enough to be my children (If I started young!) but, it was getting out and talking to people! I am taking the class and the lab aides some Buckeyes. They are peanut butter and chocolate treats that I normally make around Christmas time. However, I wasn't in this class around Christmas - hence the appearance of them now. I only made a quarter of a recipe so I didn't tempt myself to eat more than one or two (or three - they are REALLY good!). No, where was I . . . oh yes! I am getting ready to leave for class and I popped out to get the mail. Where I live we don't have mailboxes at each house. There are community mail boxes on each block where each house has its own little mailbox - sort of like the post office boxes but out on the street (well, sidewalk). So - there I trotted to get our daily dose of junk mail, address labels, and bills. When I opened the front door there it was. Another phone book. I don't know about your city but, ever since we moved to the Dallas area, we have been bombarded by phone books! Yellow pages, white pages, community pages, pages which we haven't figured out yet. Books and books and books. I am not talking one or two or even three. I am talking in the double digits. Hubby valiantly tried to control the phone book population by weeding through our phone book cabinet (yes, an entire kitchen cabinet is dedicated to the things!) each time a new book arrives on our doorstep. Personally, I think we should just throw them all out! After all - how many times do we actually use phone books in this day and age anyway? It is much easier to hop onto the Internet and Google something than to figure out which of the multitude of phones books to look in! How do phone book companies (are there such things?) make a profit from this? I know that our area is a big area with a LOT of businesses and stores and stuff but, come on! How many places can each of those businesses afford to advertise? How many innocent trees are being cut down in their prime to manufacture these tomes? Why are they distributed without being ordered or asked for? Wouldn't it make more sense to only hand the darn things out to people who want them and who will (maybe, possibly) use them? Thank goodness our recycling service takes phone books. Hi All! In the name of fairness, I thought I would show you what my other kiddo was doing yesterday while I was blogging . 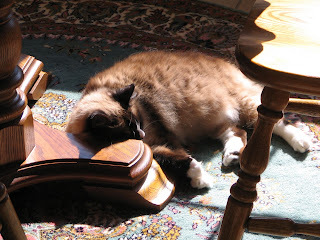 . . Yep - Miss Cleo is such a sun worshipper. Her position under the table is a vast improvement over her first spot for sun bathing - ON the table. It took a couple days but she now likes this spot. The carpet is softer than the tablecloth anyway! Of course I don't know about the table leg pillow! Well - I finished the cover less book! It is Katherine by Antonia Van-Loon (which just HAS to be a made up name, doesn't it?). This is yet another of Grandma's books. I don't think her pile will ever diminish! I keep reading and reading and the stack doesn't ever seem to get shorter. I wonder if Hubby is replenishing the supply? Nah - he wouldn't know what books to put in the stack! Sadly, he isn't much of a reader! Anyway - this book is set (wait for it!) in the late 1800's- early 1900's. This time it is a mill town in Massachusetts and a woman who foolishly marries the handsome but very cold mill owner thinking that she will change him into a feeling, loving husband! Ha! How many people have learned over the years that you CAN'T change a man once you marry him? Sure, you might be able to change his clothes by throwing all his old ones away and buying new ones. You might be able to get him to eat more veggies by slipping them into his meals. But real change? I don't think so! By the way - while I have encouraged Hubby to eat more veggies and sometimes resort to camouflage, he vehemently rejects any input I might like to have on his wardrobe - even going as far as disliking everything that I like. It is getting a bit better but . . .
Luckily I love Hubby just the way he is! He is such a wonderful man! 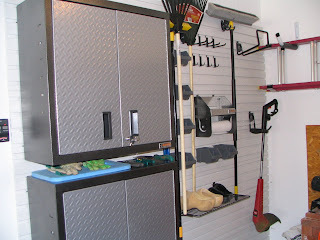 Speaking of Hubby, he told me yesterday that he was considering adding even more of the Gearwall panels to the garage so that he can organize the rest of his stuff! You could have knocked me down with a feather! I had suggested such a radical idea on the day of the initial installation and was met with the protest that it would cost too much money! Last night Hubby even checked the Internet and found out that he can get the panels on sale! Wow! I am getting good at making him think my ideas are his - aren't I? Seriously, I am very proud of him for mulling this over and making plans on his own - I may have originally suggested it but Hubby would never agree to it unless he had thought it through himself and saw the merit of such a suggestion. Soon I will have more pictures of our organized garage. Of course it might be a while as Hubby will wait to find all of the material on sale - for which I think he is very smart. Those darn panels are expensive! Voice update - the voice is a bit better today but when I raise the volume too much those darn h,w, and p sounds cut out on me. The volume is more than it has been lately but not "normal." Of course - who wants to be normal? I am still plugging away on the exercises. I have speech this week! While I am Blogging . . . I was posting my last blog and had "company" who was really whining for attention. I had to stop and pet the little bugger. He was happy for a while - this is what he was doing while I finished up my post . 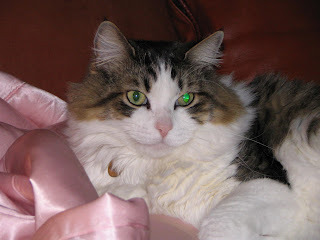 . .
That is my "little boy," Q-Tip. Isn't he funny? Gotta love him! My friend Coffeebean at The Righteous Buzz posted a question about if you ever wonder about God and His existence. Well, I have been thinking a lot about that in the past couple of days. I have always wondered. I was raised in the Methodist church and did Sunday school as a child. Eventually I became more involved in church matters - singing in the choir, being on different committees, etc. I have always believed in God. However, I have always wondered also if religion was really something that God wanted us to follow of if it was a man-made creation designed to control people. After all, look at world history. There are many examples of the church being used to control people - true they are generally illiterate and uneducated populations but still . . . The inquisition was basically a religious reason to conquer people. The Salem Witch trials - a religious reason to follow the societal norms. Communism dismantled (or tried to) a vast religious tradition as a way to control the peasants (religious control in reverse). Were these just human manipulation of a God created mechanism or were they examples of religion being created by man for ulterior purposes? I see evil in the world: war, murder, prejudice, hatred, violence. That makes me wonder if God would have created such blights on his creation. Then, there is cancer and other incurable diseases and disorders (including SD). Why do good people get such things if there is a God? However, recently I have sort of come to a conclusion for the time being. I think that the mere fact that we, as humans, can even wonder is evidence of God's existence. Evolution just doesn't strike me as capable of resulting in such higher level thinking skills. I mean, if evolution could result in such thinking in humans, don't you think other species would also evolve in similar ways? Where are the philosophising frogs and chickens? The pontificating pigs? The conversational cows? I think the fact that we can question God's existence proves that there is a God. Also, just take a minute to look at all the wonders in this world. Yesterday Hubby and I saw a duck with her brood of about 7 little fluff balls. We also watched birds swoop and glide as they caught bugs. Plants burst forth in flower (granted, they were white ones which interfere with finding white golf balls but they were there and were pretty!). Such wonders, while possibly enhanced by evolution because what creator would allow his creations to remain static and unchanging? Such wonders had to have been set into motion by something more powerful and knowing that us. Think about it - if humans had designed the world we would be in a big, big mess! So - rambling aside - I do believe. I have some problems with organized churches because of some past experiences but, the reason for church - I believe. That doesn't mean that I won't continue to doubt but isn't that the whole "name of the game?" Yesterday my husband and I headed off to see The Wedding Singer - a musical. Let me tell you that dear old Hubby was THRILLED! He just LOVES musicals and theater - NOT! But, he does go with me and I would like to believe that in this third (or is it fourth) year of going to musicals, he is beginning to soften. He does quote odd lines from the production hours after he has seen them. Of course they are usually the less "polite" lines and he normally says them out of the blue and then laughs at his own cleverness. I guess it is good that he is getting SOMETHING out of the experience. The musical - I don't know if you have seen the movie - it is a fun little romp through memories of the 80's. It contains the classic boy meets girl, girl is engaged to other boy, girls falls in love with first boy despite the engagement, boy and girl's fiance have a fight, boy and girl get together and live happily ever after story line. This time all of this was accompanied by 80's style wardrobe, hairstyles (remember the mullet??) and music. Two of the songs from the original movie were in the show - both of which were written in part by Adam Sandler. My opinion of the musical . . . it was okay. What high praise, huh? It was okay. It was amusing at times and entertaining at times but, overall, it just impressed me as - okay. I did buy a CD to add to my musical music collection (does that sound right?) because it is, after all, tradition and I have to build my music collection! If The Wedding Singer shows up in your town and you are thinking about going, I say - Go for it! It isn't the best of all musicals but is an amusing way to spend a couple of hours - especially if you sit near the back and get to watch the choreographer in the sound booth "helping" the cast dance. That was Hubby's favorite part - seeing this man "dancing" in the back! My favorite part was moving away from the woman next to me wearing too much perfume! Which is a topic I will tackle at a different time. Our day was very cloudy and overcast most of the day. This played right into the weathermen's prediction of "severe weather." We knew that the "severe weather" wasn't coming soon because we saw a blimp while we drove to the musical. It was at the Byron Nelson Golf Tournament and we knew that it would high tail it out of there at the first real threat of "severe weather." I mean, can you imagine being in a blimp in the middle of a big storm? Wouldn't that be "fun?" So here was this cloudy day which was a bit chillier than normal (Thank God for cold fronts!). It was all leading to a validation for the weathermen's prediction of a bad storm in the evening. The, we got out of the musical a couple hours later and the skies were clearing and the sun was actually shining. The blimp was long gone but we couldn't be sure that it was due to upcoming weather. It might have just wandered off to view something else from thousands of feet in the air. Not looking too good for the weathermen! But - for some reason - I still had faith in those pretty colored computer simulations of the upcoming weather. I mean, who could just make up those masses of green, pink, and black? We got home without a single sprinkle on the windshield but the storms were predicted for later in the evening. The NFL draft was on (oh LUCKY me!!!) so we watched that, then some Tivo'ed stuff. It was getting later and the skies were still not too cloudy or dark. Night fell without as much as a droplet of rain. Hmmmmm. Didn't the weathermen predict the storm would start just before sun down? The family - ALL of us (me, Hubby, and the two cats) got into bed and drifted off. Some of us faster than others. Still no rain. At about midnight I woke up with a cat helpfully kneading my bladder (see what fun cats are?) and I heard the faint trickle of light rain. Oh boy - here it comes! I thought. I snuggled back into bed and waited. And waited. And waited. I know I dozed off several times in the midst of all this exciting waiting but, being a really light sleeper, and positive that I would have woken up had the "big storm" hit. Nothing. When my alarm rang in the morning to remind me to get my medicine, I looked out the window. The patio was wet - barely. The rain gauge help a fraction of a fraction of an inch of water. Not too impressive. I went back to bed and when I woke up again several hours later there was almost a quarter of an inch of rain. Wow - the weathermen really predicted that one wrong! Can I ever trust them again? On my way to the musical I changed purses! It only took me two tries to wedge everything in so that it fit without making the purse a cumbersome shape. I will admit to a bit of muttering under my breath and that Hubby kept assuring me that I would have to buy a bigger purse. I pointed out a HUGE purse that the lady next to us at the musical had (not the lady with the boatload of perfume - on the other side) and Hubby told me that all a big purse would do would be to encourage me to get more stuff. He said this despite the fact that I was carrying his candy (to be eaten during intermission as a treat for making it through that much of the musical) , the CD I had purchased, and the binoculars! All of this stuff crammed into my purse which seemed too small to handle my "regular" stuff! Interesting! God Bless the Cold Front! Yes, I live in Texas and can't stand the heat in the summer! Usually our summer begins in April or May and lasts until about October. It gets hot and humid and totally yucky! Every time you walk outside, you get sweaty and gross. I know there are people who enjoy the heat (I think the heat has melted something in their brains) but, really - 90+ degrees all summer???? Whose idea of a good time is that? It was edging up to those summer temps here lately with days in the mid 80s - which I think it too warm for April! Luckily, the mornings when I walk were still pretty cool and breezy and the evenings were cooler. However, yesterday a cold front wafted through our fine state leaving the humidity near zero and the temps over night in the mid 50's. Heaven! The windows were open last evening and our evening golf ball searching walk was very pleasant. That is the kind of weather I want to experience instead of the Texas summer!! Well - my voice took a southward turn last night. Nothing too major - just more difficulty with those darn "unvoiced" consonant sounds - h, w, p, etc. I was good in the morning when I was reading out loud. Then, Hubby came home and it seemed like the voice demons hit! Suddenly I was sounding like the TV when the audio blips in and out. Parts of words were missing and no matter how much I tried - they didn't come out! Of course - I could hear my speech therapist in my head telling me to talk quieter and to not push so hard. So, for once, I took her advice. I cut the volume back to the barely audible range and was able to voice those darn sounds. Of course the lack of volume made golf ball searching on the course interesting. If Hubby and I got more than three feet apart - forget conversation. It was back to the whistling signals when I found a ball for him to pick up. What fun. Needless to say - the whole voice set back made me a bit sad. Then again- I was a bit sad before I tested out my voice with Hubby and realized it was going down. I am not sure why - probably work worries combined with watching Grey's Anatomy (a new episode from Thursday which I Tivo'ed. I LOVE the show but it always seems to leave me feeling a bit "down."). Luckily, the walk and golf ball search helped lift my spirits because of the coolness of the evening. Also - being with Hubby helped like it always does! Well - I finished another book! I actually finished it yesterday but forgot to scan the cover so I didn't get it blogged. This is another from my grandma's stash (which seems to be growing instead of shrinking) and was again set in the early 1900's. This one was in the United States and dealt with immigration and World War I and "fun" topics like that. The characters in this one are very real and interesting to read about but the whole book is sort of sad - an Irish man's struggles for wealth and love. Oh well. It was pretty good. I don't know what I am going to do about the next book I am reading - the front cover is torn off. I know that supposedly means that the book was illegally resold but after all these years - who knows what happened! I thought I should probably post an update about my voice. It has been a while since I directly addressed that. My voice is still doing very well. In fact, it is doing so well that I can periodically forget that I have ABSD. Then I have problems saying a word (usually starting with h, p, or w) and I am reminded that I have a vocal disorder. I still struggle to accept the fact that my voice won't ever be what it used to be and that when I am in a noisy situation I can't make myself heard. The phone is still a bit of a problem but I am slowly overcoming my anxiety about the "regular" phone and still love my outgoing voice amplification phone. Yesterday wasn't a "good" day for my voice. It was still there and audible but I had a lot of cracks and false starts. I realized that I now choose words which are easier to say to start off most of my sentences. I can feel when I am going to have a problem saying a word and switch to an easier word. I am getting so used to doing this that I don't even realize I am doing it most of the time. I am also a lot slower when I speak. Not as slow as my speech therapist would like, I am sure but, I do speak slower. I had sign language class yesterday and as I was driving there, I wasn't too happy. My voice wasn't good and while most of the time is spent signing, not talking, I do talk to my lab partners after class. I didn't really feel like talking but . . . by the time I had spent time in the lab and in class not talking, I was happy to talk after class. And, my voice wasn't too bad. It helped that we were in a quiet area and standing rather close together. Thank goodness my lab partners understand! They might be young but, for the most part, they are kind and know talking isn't easy for me so they make adjustments! I am still working on my vocal exercises and larynx massage. Hopefully this will help me keep going on the "good voice" path I am currently on! God Willing! It was a VERY rainy night last night in my neck of the woods. We got and inch and three-quarters of rain. Luckily, a lot of it was a softer rain that had a chance to sink into the ground before it could run off into the streets! 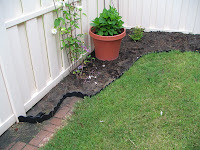 It looked like rain all day yesterday which spurred me into action to put some edging around my new flowerbed. I was out there pounding away and it really felt good to pound on something! It is hard to see in the picture but, it is there and actually didn't wash away in the rainstorm! My Clematis flowers did take a beating in the storm - a lot of their petals got blown away! How sad! 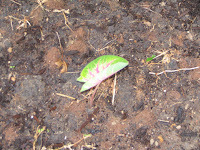 I also discovered the first leaf of a Hosta growing in the flowerbed! If you can see - it has a bit of purple/pink on it as well as green and white. How exciting! This is the only thing that has sprouted so far and it gives me hope that others will soon follow! Is it just me or is planting things sort of nerve wracking? I get nervous waiting for things to sprout. I have to keep telling myself that these things take more than one night to happen! Meanwhile, hubby just laughs at me! Speaking of Hubby - I did tell you about his golf ball collecting, right? Well, I thought you might like to see how his hobby impacts my life. 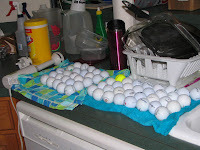 Hubby cleans his golf balls so that they look better to potential buyers and he uses my kitchen sink to do this. Of course, it is pretty much the only place to do it because we don't have a utility sink anywhere (something I would change if I was building my house again). Anyway - Hubby cleans the golf balls and then sets them out neatly to dry - on my good dish towels and right in the way of everything I might want to do - such as washing dishes or cooking. Wait - I guess I don't really want to do those things but, the balls are still in the way! I was IMing with my mother today and she reminded me that I only have two more weeks of sign language classes! My, how time flies! I have had a lot of fun taking sign language and hope to continue taking classes in the Fall. I thought about taking a class in the summer but, Hubby hopes to take some vacation time and that would make me miss too many classes so . . . I will wait until Fall. The pumpkin pie I made for class went over very well so I am happy. I didn't get my grade for my presentation (all in sign language) about how to make the pie yet so that could have been a disaster but - it is over with! Now I can start preparing for the final! Yikes! I just have to say that I LOVE my iPod! No -this isn't a paid advertisement for iPod. I would probably love any MP3 player but I happen to own an iPod so . . . I have always been a music lover thanks to my mother who made sure that our house was always filled with music when I was growing up. I learned to play the piano, the clarinet, the oboe, and the trombone. When I went to college I was a music major for almost two years and learned to play more instruments - not well but passable. I have played in orchestras, wind ensembles, brass choirs, trombone choirs, and jazz bands. I was exposed to all kinds of different music and really enjoyed most of it. Heavy metal is probably one of the few genres of music that I really can't listen to! Sorry to all of those "metal heads" out there! Anyway - when I got my iPod I started to load my CD collection onto it. Country, classical, rock, show tunes, jazz . . . everything went on. Because I wanted to listen to my music in a different way than with the ear buds I bought a small speaker system for the iPod which I set up in my music room. Docking the iPod was easy and now I could listen while doing other things (like cooking or reading). It didn't take me long to find the "shuffle songs" setting. Soon I was listening to a very eclectic mix of music. A jazz piece would be followed by a Beatles tune which would be tailed by a Bach concerto only to run into a show tune. You may be thinking that it would be chaotic to listen to such a mix but I find it very enjoyable and even enlightening. Instead of the pieces just blurring together because of being similar to each other, each piece stands independently and allows me to really hear it. Does that make sense to you? I can hear the beauty of each piece - be it polka or rock - because it is so different from the previous piece. This has made me crave more and more different kinds of music to add to the mix. I listen to several pod casts which introduce different kinds of music. I talk to friends and family and get ideas for different music. And, I must admit, that I bother my sign language lab partner to get him to give me some of his favorite music. We were in a discussion about the music we liked at the time so it just seemed natural! Last night at class, my lab partner gave me three Cd's that he had burned with some of his favorite artists. I listened to one of the Cd's on the way home and liked the different sound of the music. Some of the lyrics were a bit "raunchy" for me but then again - I am "old." Well, I have loaded the Cd's onto my iPod and can't wait to hear the songs mixed in with my collection. And I continue to prowl for more "different" music that I can put into the mix. There is one girl in class who is from China . . . she might be a possibility! Have you seen the show "The Big 4-0" which is a new reality series on TVland (I think that is the channel - Hubby changes the channels so often and so quickly that I can get confused!)? I haven't actually watched the show but have seen plenty of commercials advertising it as the next "big" reality series. The whole premise is that people who are turning 40 celebrate the birthday by doing something big, bold, and exciting. The commercials show people jumping out of planes (which seem to be perfectly good, by the way), throwing HUGE parties, bungee jumping . . . I think you get the picture. Anyway - I am turning 39 in about a month or so and you all know what comes next - 40! One of my friends has already asked me what I am planning for my "big birthday." First of all, I hadn't thought of it being such a big deal until she asked me and then I saw those darn commercials. Next, I started thinking of what I would do - if people are celebrating on a reality show I guess I should do something to celebrate. Finally, I totally rejected all of those "daring" things like the jumping out of planes (I am terrified of heights) and bungee jumping (see last comment). However, I did start thinking. I would like to take a cruise somewhere in Europe for my birthday. I think that would be neat and, hopefully, safe. Hubby isn't too sold on the idea but I do have over a year to convince him that it is HIS idea! Scandinavia has always fascinated me with the fjords and stuff. That would be fun. England would also be neat but, I hear it is pretty expensive. But then again - it is my "big" birthday so money is no object, right? Convincing Hubby about the truth of that last statement will probably be an impossible task! Last night I was also thinking of doing something more. I have always been interested in donating to worthy charities (I get that from my father who has always wanted to find someone who needs a car. He would like to just get out of his car, hand the person the keys and walk away - and he thought this before the movie "Pay it Forward" ever came out!). I came up with an idea to "Give 40 40" in honor of my birthday. I would like to give 40 people or charities $40 each. Of course I am not sure of a couple of things - first that I will have that kind of money, and second, just who in the world I would donate to. Forty people/charities is a LOT to research and find. Also, if I give to 40 different charities, I really DON'T want to get forty envelopes containing appeals for more money every month. Being responsible for the killing of all those trees wouldn't be good! It is just a thought. . . I haven't shared with Hubby yet and I haven't decided that is what I am really going to do. It just sounded nice at midnight last night as I listened to Hubby snoring away. Anyway - I am going to post this and get to work on my sign language project. 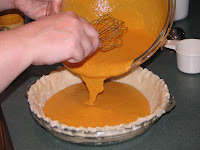 I have to describe how to make my favorite food - pumpkin pie! I made a pie last night and had the faithful Hubby take pictures of all the steps (he only grumbled a little bit) so I can put them into a PowerPoint to show as I sign my explanation. I think everything will go well but - I don't know how to say pumpkin! Normally I am woken up by my kittie alarm clock just in time to make "Daddy" his lunch and send him off to work. However, this morning I was woken by a crash and that oddly musical sound of shattered glass. At first I was a little confused - I was in BED - what was glass doing near my bed? Then I remembered - my husband. He has a bad habit of bringing actual glass glasses into the bedroom and leaving them on his nightstand where they are easy prey for our wonderful big kittie. Now, I am sure you will think what I did at first - the kittie finally got the glass off the nightstand! Nope! My darling knocked the glass off the nightstand by himself while groping for his alarm clock. Why was the glass in the direct path between the bed and the alarm? Good question! Maybe I will ask Hubby when I am not cleaning up glass at 6:00A.M. Or maybe not. That is right - I cleaned up the glass. This was for two pretty logical reasons. First, unless I wanted Hubby to climb over me to get out of bed - he would have had to walk through glass in his bare feet. I am not THAT mean. Second, without his glasses, Hubby is pretty much blind. Not too good for picking up glass. As far as breaking glasses goes, Hubby did an excellent job. The glass hit the rail of our Amish made, solid oak bed and disintegrated into tiny little shards, one of which is now making itself at home in my right index finger. I guess I will have to get the duct tape to get it out. That is the wonderful way I woke up this morning. And after all of that, I almost forgot to make Hubby his lunch! What a morning! Okay - when did I suddenly get so old? It seems like only a few short days ago when Saturday nights were times to go out and have fun. Now, not so much! Yesterday we spent most of the day waiting in our front yard for someone to stop at our very sad, pathetic excuse for a garage sale. We had a few little items out (including a big, stuffed snowman that freaks my husband out every time he sees it. I think that is because it is almost life sized and hubby thinks there is a person sitting there.) and hubby's old tires from his car (which are really brand new but not as nice as the ones he bought on eBay!) and, of course, the golf balls. You all know about the golf balls so . . . wait, you don't really know about the golf balls? Well, when my speech therapist told me I should start walking to help with my breath support, I begged and pleaded with hubby to walk with me each day when he got home from work. He wasn't too happy about doing it. He did walk with me though. Then, he had a revelation. We live near a golf course and he really likes finding lost golf balls. Hubby cut a deal with me. He would walk if, at the conclusion of each walk, we could go hunting for golf balls. I naturally said yes - anything to get him walking - and the golf ball saga began. We search the empty lots adjacent to the golf course for balls and even enter the course when the golfers are done to hunt around the little pond and in the roughs. This is actually a very good way to find golf balls. In fact, due to our walking now for over a year, we have HUNDREDS if not THOUSANDS of golf balls in our house! The entire guest room is being taken over - which presents a problem when we actually have guests! Hubby diligently cleans each golf ball and sorts them according to type and condition. He and I created business cards and fliers for his new golf ball reselling business. Lately, he has actually been doing pretty well selling to friends and co-workers. Anyway - back to the yard sale. The whole reason hubby wanted to put things out was to try to sell the golf balls. I have made a nice little sign for him to put out in the yard and he sets out his wares in a pseudo attractive way (he is a man, after all). Then we sit and wait and hope. Actually, we didn't just sit and wait. We figured that since we were out front anyway we should trim some more shrubs. The battle with the shrubs continues! Both of us worked for about two hours and we managed to get three shrubs trimmed. Those darn shrubs! Now we only have four or five left to go. Unfortunately, the shrub cutting was the most activity we saw all morning. People would drive slowly by our wares and then speed off into the distance. Hubby kept muttering under his breath that "It's all good!" but no one took the hint. We did sell a dozen balls to "two young kids who don't even play golf!' but that was about it. So - at 1:00 we hauled everything back into the house/garage and gave up. A nap seemed in order after the battle with the enemy shrubs and that led right to dinner. After dinner . . . it was TV and a book. Where did the fun Saturday nights go? Oh - wait. That WAS the fun Saturday night! I told you that I am a pretty fast reader - despite the month it took me to finish that Jane Austen book. Here is proof. I finished this book last night. It is another golden oldie from my grandmother and I must say that she certainly enjoyed . . . "romance (wink, wink, nudge, nudge, you know what I mean?)!" This book was full of it! Romance that is! This book is set in France just as the revolution is starting . . .quite a coincidence since my parents and Aunt Donna and Uncle Al went to see a high school production of Les Mis. last night. Which, of course, is set in the French Revolution. I must admit that I skimmed over most of the "romantic" sections of the book - and there were a lot of "romantic" sections - because that really isn't my "thing." However, the book was a quick read and was entertaining. Not a bad selection from my pile of "oldies but goodies" from Grandma! The other thing I have on my mind today (as I am avoiding going out and sitting with my husband in the midst of our pitiful yard sale offerings) is purses. I know some women are into the bigger is better mentality when it comes to purses - especially mothers of multiple children - but personally, I have always been a small purse kind of gal. I don't want to lug around a purse weighing 50 pounds and which needs its own seat in restaurants. Not that there is anything wrong with that if it is what you do! I just like small, compact purses. My purses when I was single were cute little things. They held all of my essentials - money, lipstick, mirror, feminine supplies when needed. They weighed a total of maybe 6 pounds - if I had just gotten money from the bank! Now, things are a little different. While I still want small purses, my reality has changed a bit. Not a whole lot - just a bit bigger so all of my stuff can fit in. Now my purse must carry the wallet - mine and usually my hubby's when we go out, the mirror, the lipstick, the feminine products - as needed, a small notepad for when I can't be heard, a little zippered pouch full of gift cards, a business card case containing my podcasting cards as well as informational cards about SD (the trifold cards sold by NSDA on their website), and my Spokeman amplifier and microphone. As I type my little list of stuff, I realize that the heaviest things that I carry are related to my SD. My Spokeman is little but it does weigh a bit and the microphone, which pretty light, takes up a lot of space and can be difficult if the cord gets wrapped around every single item in my purse! The SD informational cards probably don't weigh too much but they do add to the SD weight in my purse as does my little notepad and pen. Wow - SD really adds a lot of "accessories" to my life! Interesting. I still look with longing at the little purses which would have worked for me prior to SD but the snap back to reality and start looking for one I think will fit all of my stuff - especially my Spokeman which I am never without! Maybe it is only a matter of time before I start looking at the larger purses and think - "Hey - that looks just the right size!" Oh, where did my small purse days go? Curled up under the fluffy comforter, our heroine sleeps as her husband gently snores at her side. The green glow of the alarm clock from the bedside table shows as the minutes tick by accompanied by the tock of the living room clock. Slowly the time passes. 3:02. . . 3:03. . . Outside, the storm which raged earlier has worn itself down to a gently pattering against the window panes. 3:28 . . . 3:29 . . . In the cozy living room two cats doze snuggled on the leather sectional between bouts of maniacal chasing, water breaks, and midnight snacks. 3:44 . . . 3:45 . . . the numbers on the clock continue to count the time. Our heroine stirs as there is a slight sagging of the mattress near her feet but she doesn't wake up. The comfortor rustles slightly as padded feet make their way up the bed between the sleeping couple. Hubby's snores cover most of the sound with snorts and wheezes. 3:52 . . . 3:53. . . The rustling stops. The heroine's pillow suddenly tilts to one side but still she doesn't wake. Now a quiet rumbling sound joins the snoring. Occasionally there is a watery licking sound interrupting the rumbling which gradually increases in volume as the time continues to pass. The "sweaty" dreams of our heroine ( which each of her three doctors blame on the medicines given by the others and which have nothing to do with any "sweaty" activities in them!) begin to include the odd rumbles. Her nose twitches as something brushes against it and, sighing, she turns her head to the other side of the pillow. The irritation seems to follow her causing her to mumble angrily in her sleep. 3:59 . . . 4:00 . . . The rumbling increases in volume until it dominates the heroines dreams. She dreams that she is on a highway behing a very noisy truck spewing irritaing smoke which makes her nose itch. 4:15 . . . 4:16 . . . As she tried to turn over, she finds her pillow to be mysteriously smaller. There is hardly any room for her head. Half waking, but without opening her eyes, she moves her head further to the side of the pillow. Now she rests only on a tiny corner of the pillow while the rest is occupied by another presence. 4:20. . . 4:21. . . Suddenly, the heroine is awakened by a heavy slap to her face! She gasps and half sits up in bed. He eyes pop open to reveal the source of her awakening. 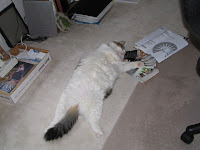 A furry kitty is sprawled on her pillow looking at her through eyes no larger than slits. He is rumbling loudly in his efforts to wake her. Relieved to find her irritant something so familiar, the woman sighs heavily and turns onto her stomach. The cat instantly leaps to her back and begins kneading. He will continue to knead for at least ten minutes during which our heroine slips off to sleep again while wishing the cat would move just a little to the left to hit that sore muscle. 4:28 . . . 4: 29 . . . 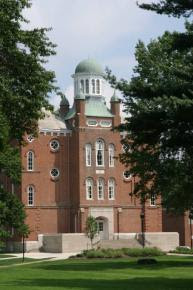 This is the "main" classroom building at Mount Union College - my Alma mater. I don't know about you and how your Alma mater works but my college sends me a nice little magazine every once in a while (who knows how often - it just shows up!). The magazine tells about new things happening at the college, student news, financial information (usually asking for more money of course! ), and alumni news. I always enjoy perusing the information and marveling at how much the place has changed since I was a student there! All of the new buildings are amazing since the college is a tiny little thing. Well, I guess it is expanding now! Anyway - I like reading the alumni news section to see what is happening to people who I might have known in college. There are short little blurbs about new jobs, new children, new marriages, etc. I ponder each entry and think about the person as I knew him/her in college. It is a fun little "time machine" trip each time the magazine comes! There is one part of the magazine that gives me a little twinge though. At the end there is a form for updating information. You can send in information for a future magazine and have your very own little blurb! Well, I look at that form and I think - it would be nice to let people know what I am up to. Then again - I am really not up to anything! I don't have a job so I can't include information about that and there are no awards anywhere on my horizon so that section is shot too. We haven't moved so there is no new address (not even a new email address!). I don't even have children to brag about! There is an "other" section but - what am I going to say? I am unemployed and vocally impaired? Who would want to hear about that? I envy the people who have things to share! At least I can share with you! I am FINALLY done with this book! It took me a month - yes, I know that might not seem like a big deal but, you have to understand that I normally read about a book a week or more! 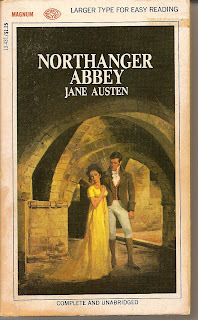 This one, a classic, was a bit of a slog to get through - no offense to Ms. Austen! You see, I got a big box of books from my grandpa's house which had been my grandmother's books. I am reading my way through the pile of books. My husband in thrilled because I don't have to buy any new books for a long time - there are a LOT of books. For the most part, the books are enjoyable. They are mostly set in the Victorian era or around there - not my normal reading choice these days - and are a bit old - but still pretty good. I was whipping through the pile until I got to this one . . . it really slowed me down but , I AM DONE, I AM DONE, I AM DONE! Now I can move on to other books which will hopefully be a bit faster! About two months ago (Has it been that long? It might have only been a month ago!) my husband got a Wii game system. I know it might sound odd for a couple with no children to own a Wii but, it is fun! We had played a few games on a Wii when we visited my friend Jill and her husband, David, over Christmas. They have two young sons which explains why THEY have a Wii. Well - we had so much fun that my husband decided to look around for one. Of course they were impossible to find because the stocks were depleted over the holidays. Luckily, a friend from my husband's work found some at a Cost Co and bought one for my dear hubby and one for another friend at work. So, long story a bit shorter, we have a Wii! Bowling is currently our favorite Wii activity but lately I have tried out tennis and, last night, boxing. I must say that for a video game, I really worked up a good sweat playing tennis (I lost) and boxing (I won!). It might be a good thing for me to play this darn game daily to get in some aerobic exercise in addition to walking every morning! Who would have ever thought that a video game would make you sweat? Now Wii is apparently coming out with a fitness component aimed at people like me who want to workout in a fun way. I haven't really researched the thing yet but . . . my birthday is coming up. I am torn between the fintess thing - which would be good for me - and guitar hero - which is only fun! Yesterday I went to my speech therapist. I only go every other week now because my voice is doing so well. Those are words I didn't think I would ever say less than a year ago! I am happy that Susan - my speech therapist - still thinks my voice is doing really well. She did say that I am pushing a bit too much to get more volume - a problem I seem to have a hard time geting over. She wants me to use my microphone more often but as I don't work I never really have an occasion to use it. Pretty much the only place I am around a group of people is at Sign Language class and we certainly don't use our voices much there! I am continuing to do vocal exercises - inhale "e's," Inhale/exhale "e's" matching the pitches, massaging my larnyx, reading out loud for at least two half hour sessions a day. The best place to do the whole massaging thing is during commercials while I watch tv or at stop lights when I am driving to class. The other things I do as I drive or putter around the house. I suppose I sound like a total loon but . . . my husband and kitties are used to it by now! I am hoping that by continuing these exercises my voice will stick around for a long time as it is - which is a LOT better than where I was even six months ago! Thank God! This is my second post of the day - I know, I know - I spend WAY too much time on this darn computer! It is just so darn addicting! Anyway, I need to vent a bit. I go to the NSDA bulletin board regularly and I do post replies once in a while when I feel I have something to say - by the way - Coffee Bean's posts are fabulous! I also post when I update my podcast. For a while I was begging and pleading in those podcast posts for people from the bulletin board to let me know what kind of issues they would like to hear on future podcasts. My answer was crickets! I could actually hear those little buggers chirping while I checked the bulletin board. Okay - so maybe most of the BB people don't "get" the whole podcast thing and don't feel like responding. Fine. Then I posted about my work worries. Again - crickets. I reply to posts and once in a while get a reply to my reply (a bit of cyclical reasoning there, I think!) but for the most part, crickets. Am I being too agressive in my posts? Too pushy? Do I just not reply enough to earn interest from people???? I am feeling a bit ignored in that area. My insecurities are showing again - let me slip into the ladies room to adjust myself! Thank goodness I have some wonderful blog friends who let me know I am not alone in the universe! Bless you all! Happy World Voice Day! I did a podcast and tried to link it directly to this site but . . . not so good! If you would like to listen to my podcast, go to the link at the top of the blog or go to Learning To Live With SD. What is World Voice Day you might ask? It is a day created to help people learn how to take care of their voices and to raise awareness of vocal disorders (like Spasmodic Dysphonia???). Many people are in professions where they rely heavily on their voices - teachers, clergy, salespeople, receptionists, courtroom attorneys, telemarketers, and politicians. These people (and more) use their voices constantly and most don't think about vocal health until something goes wrong with their voice. They might push their voice through periods of hoarseness and abuse their voices by talking for long stretches of time, letting their chords get dehydrated, and talking loudly to compensate for background noise. All of these things can contribute to vocal problems. The American Academy of Otolarnygology - Head and Neck Surgery Foundation has created several fact sheets to educate people about how to take care of their voices, how the voice works, and vocal health at every age. You can find this information at www.entnet.org and then click on "Patients." Take it from someone who knows what it is like to not have a voice - you don't want to hurt your voice! Take a minute and investigate the information on how to take care of your voice! 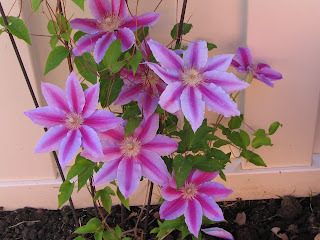 The Clematis I planted last year. I am going to the Cheese Cake Factory for dinner! Yeah! If you have never eaten at a Cheesecake Factory (Is that two or three words anyway?? ), you are really missing out! It is a chain with super food and heavenly cheesecake! My personal favorite is the pumpkin but, they only carry that flavor around Thanksgiving so I don't get it too often. In fact, the last time I went to the restaurant around Thanksgiving (it was a week after the holiday) they were OUT of the pumpkin!!! The menu said they carried it until the beginning of the year - they lied! Oh well - I forgive them because the peanut butter truffle cheesecake is good too. My anger from yesterday - which was totally not like me - is pretty much gone. 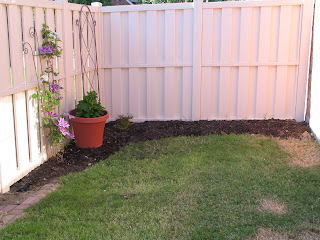 It helped that I worked on a new flowerbed pretty much all afternoon. Our soil is made up primarily of clay so it is tough to dig and then has to be mixed with soil to make things grow. That took a lot of energy and helped with whatever frustrations I was feeling. By the time my husband came home, I felt much better. It also helped that he made dinner (stuffed shells, green beans, and french bread baked with the shells) and suggested Cheesecake Factory for tonight! I have a wonderful husband -have I mentioned that? When I was going through the initial stages of SD - having absolutely no voice and not knowing why, going to all of the doctors and therapists and having cameras threaded down my nose, all of that FUN stuff - I was a little nervous about how my hubby would react. After all, he married a woman who LOVED to talk and who was very social. In fact, when we went to HIS work events, I was the one who did most of the talking - not him! I did a fair share of public speaking and loved meeting new people. Then, suddenly, I couldn't do any of that. I couldn't talk at all, let alone in social situations which were a bit noisy! I couldn't talk on the phone at all. My husband found himself thrust into the position of the family spokesman. He had to do all of the talking - from ordering for me in restaurants to making doctor's appointments on the phone. For a man who is pretty shy - this had to have been terrifying and difficult. This was NOT what he "signed on for" when he married me! While he stepped up very admirably and even came out of his shell a bit, he wasn't always too happy about things. One night when we were in bed - one of the few places we could really talk because we were close together and it was quite - he told me how angry he was that I was changing our life. I was devastated! I was sure he would leave me. Luckily, he didn't and he has adjusted fairly well to the whole "non-talking wife" issue. He has heard his share of the "You have what every man wishes for - a silent wife." jokes and has been frustrated with trying to talk to me in Wal Mart - which is very noisy! He has gotten used to me wearing a microphone around and doing all kinds of weird sounding vocal exercises. Lately, he has even accepted the fact that this is an incurable disorder and that I will struggle with it for the rest of my life. All of this on top of the fact that he cleans and cooks (not ALL the time on the cooking but he does cook two times a week when I am at class) and takes care of the cats and takes care of me! I love my husband and thank God everyday that I have him. Now if he would clean up the rest of the garage . . . I am angry. I don't know why. I don't know at whom. I don't know at what. I am just angry. I feel that horrible turmoil inside which marks anger. I think there might be some frustration at something mixed in for good measure. I feel like screaming - everything, absolutely everything - seems to hit a nerve. Nothing I do seems to be right. My voice is doing okay today but I am angry about having SD. I walked today and the birds were doing their best to chirp melodious tunes but I didn't want to hear them. The sun was trying to shine and warm me up but all I felt was the cold of the shadows cast by the overlarge houses. I am just angry. I told my husband about my anger last night and he said that I didn't seem angry. That is good, i suppose. It would be worse if I went around looking as angry as I felt and scaring people in my path. I do have to go to the grocery store today (and I am angry about that, of course!) and don't want the poor check-out person to cringe when I show up. It could be hormones or the pollen count. It could be the swings of temperature we are having lately. It could just be that I haven't been good and angry for a while. I don't know. All I know is that I am angry! I hope your day is better and less angry than mine! My husband and I just got back from church and I have to say - it was a good voice day. So much of my life has been spent singing - either in church or out - that when I had no voice due to SD it really bummed me out that I couldn't sing. I would go to church and silently listen to the congregation sing and be sad that I couldn't join in. Reading the words silently as others sing is just not the same! I know that a lot of people with SD say that they are still able to sing even when they have no voice. I, on the other hand, was unable to do anything. I couldn't talk, sing, yell, or hum. I was basically totally silent. What a change for someone who always wandered around the house humming or singing (and driving my husband crazy!). Now that I have recovered my voice to the point it is (which is pretty darn good compared to where I was at) I amnow able to hum and sing again. It was great to be in church and finally be able to sing along to the hymns. Of course, I have to sing pretty quietly and not all the notes come out but, I am still singing! Take that ABSD! I am singing despite you! And you thought you would rule my life forever! Hah! In the words of one of the hymns we sang this morning . . . Praise the Lord, praise the Lord,Let the people rejoice! Today my husband and I tackled one wall of our garage. We put up wall panels, cabinets, and hooks to organize stuff. Why is it that there is always too much stuff in the garage? Anyway - here is what it looks like now. Of course I didn't take a picture of the other side of the garage which is still full of stuff we have to put away in the cabinets and onthe hooks and in the bins. I will have to say that I am very impressed that my husband finally took the initiative to start getting organized out there. It has always sort of been his domain so I never say much but being out there for any length of time makes me antsy. I want to start organizing and cleaning . . .but, if I do that he will never find anything ever again so I restrain myself. I did make sure that my family tradition of injuring oneself during any home improvement project continued. Yes, it is only a little chunk out of my left index finger - it hardly bled at all - but, I think it still counts. Even more impressive than the fact that this actually got done after months, if not years of talking about it, is the fact that my husband and I didn't get into one fight the entire time we were working on this. He even asked my opinion and listened - once in a while! After almost eleven years of marriage we might have finally done our first project together without ending up mad at each other! What a break through! Hopefully this will lead to more projects without bickering! Oh - my husband just walked in and he thinks I am saying how wonderful he is so - "Honey, you're the best!" I said yesterday that I should get out there and trim shrubs - well, I actually did it. Of course I am not nearly done with the whole adventure! 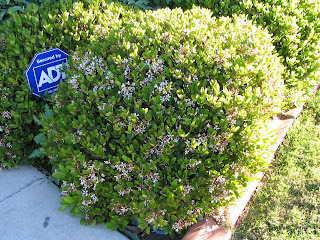 It seems like as soon as I trim a shrub it grows back again with a vengeance. I guess that is why I consider the shrubs my enemies. My mother has a real talent for gardening. She can trim a shrub so it looks great. Her trimmed shrubs look like they grew shorter naturally. She has showed me her secrets to trimming but I don't quite have the hang of them yet. Also, I don't think she is dealing with the kind of shrubs I have. She trims her shrubs once, maybe twice a year. I have to face the dumb things once or twice a month in the spring, summer, and fall - they grow that fast! If I don't continuously trim, the shrubs would succeed in their attempt to take over the entire front of the house! They would completely cover up the facade of our house and no one would even know there was a house under all the shrubs! They are that vicious. On my morning walks I see their friends trying to take over different houses in the neighborhood and they are almost winning the fight at some houses! 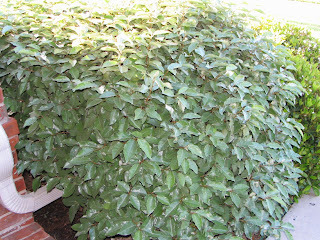 I must admit that I use small caliber weapons in my battle with the shrubs. I don't haul out the power trimmers that most people use around here. No, I use hand held trimmers. I think - and my husband agrees - that the look is better than using power shears to just trim the darn things into cubes or circles. True it takes me about twenty million times longer to trim by hand than it takes those with the power tools but . . . I enjoy it????? I do enjoy working in the yard but I must admit that at times I look at the neighbors with the power tools and feel a touch of jealousy. Is it wrong to covet your neighbor's power tools? What day is it anyway? Anyone know the date? Since I stopped working I tend to get a bit "out of touch" with things like calendars. When I first realized that I was losing touch with the great order of the days, I panicked! I was losing my intelligence and the confusion over which day it was had to be the first sign that my brain was now turning into mush! Not only was this distressing to me but, after flaking out and forgetting three hair appointments in a row, it was distressing to my hair dresser! Being a person who fixes problems, I immediately went into problem solving mode. I went to the computer and printed out calendars for the next four months (without dates on them which did pose a bit of a problem for a few minutes until I found the real dates on a different calendar online!) and installed it in a prominent place in the kitchen that I couldn't miss. On these calendars I wrote everything I had coming up - especially hair appointments. Everyday I dutifully mark off each day that has passed so that I am "current." That sounds like a great solution, right? Well - yes and no! I now remember appointments - mostly due to the fact that my husband looks at my calendar and reminds me - and I am good on the days of the week but, I just can't get a handle on the date! I am even taking that Sign Language class on Tuesdays and Thursdays and date my notes each class. If you could see those notes you will see the date crossed out, corrected, and often crossed out and corrected again! What is going on? I am half tempted to take a math class at the community college to see if I have lost all numerical abilities or just the ability to remember the date! Of course I still do understand money and time so all numerical sense must not have fled my underworked brain! Interesting. I wonder if a scientist somewhere is researching why people forget the date. Maybe there is some federal funding . . . Okay, I am getting a bit "far out" right now! Back to Earth! I am making daily recordings of myself reading "the rainbow passage" which, for those of you not familiar with it, is a pretty standard passage used by speech therapists to assess voice. Here is the text of the "rainbow passage." When the sunlight strikes raindrops in the air, they act like a prism and form a rainbow. The rainbow is a division of white light into may beautiful colors. These take the shape of a long round arch, with its path high above and its two ends apparently beyond thehorizon. There is, according to legend, a boiling pot of gold at one end. People look, but no one ever finds it. When a man looks for something beyond his reach, his friends say he is looking for the pot of gold at the end of the rainbow. I am hoping that these recordings will help me figure out patterns to my voice's variations. Or at least they will help me remember how my voice was on any given day - sort of an auditory journal of progress. Also, doing these recordings keeps me cognizant of the fact that I DO have ABSD - no matter how good my voice is. That keeps me working on my exercises and my podcast! Well - my husband took today off and is puttering around the house - wait, I hear the lawn mower out front! What a good guy! However, I suppose that means I should go out at trim shrubs. Yuck! I just got in from my morning walk. It is a nice rainy day here but luckily I didn't get wet! I began walking on the suggestion of my speech therapist as a way to improve my breathing. Yes, despite all the years of admonitions from various doctors about getting more exercise, I finally started walking regularly due to my SD! I guess that is a silver lining to the SD cloud! Anyway - I now walk one or two times a day. Once in the morning and once after dinner with my husband. Of course getting him to walk took a little ingenuity! We live near a golf course and he agreed to walk with me if we could go hunt for golf balls on the course at the end of our walk. No- neither of us plays golf - he just likes to find golf balls. Our house is filled with them now! I do see a lot of breathing improvement due to the walking and am now working on getting some weight off. I have lost 3 whole pounds so far! Woo-hoo! What a big deal. I have been walking since January! I use the time on my walk to listen to podcasts. There is just so much good stuff out there to listen to and I don't have time during the day. If I listen while I walk I know I will have at least 45 minutes to listen every morning. I don't use the iPod when I walk with my huaband because I always think we will talk. Sometimes we do but more often - we don't. Even thought I do listen to my podcasts while I walk, I can still hear the sounds of nature (my mother thinks I don't appreciate the birds, etc. because of the ipod!). In fact today there were a lot of birds flying around - probably gorging on the bugs last night's rains brought out. I had a great time watching a swallow pas-de-deux this morning. I stopped and watched the birds do this intricate "dance" chasing bugs. It was beautiful. It is hard to believe that the birds can change directions so quickly! Also - I stopped down the road from my house to listen to a neighbor playing the piano. It is neat to stand on the sidewalk and "eavesdrop" on the music. Ah - the wonders of a good morning walk! I am trying out yet another "new" thing on my blog! Hopefully, I will be adding a direct link to my podcast so that you can listen directly from this page. We will see what happens! If my effort fails, you can go to my podcast site at Learning to Live With SD and check it out! 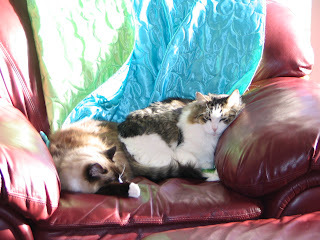 These are my "babies" - my two cats, Miss Cleo (left) and Q-Tip . I am using them as a test for me to practice putting images into my posts. Remember - I am still learning this whole blog thing! Inserting a picture is actually much easier than I thought it would be! I mean, why would clicking the little picture icon on the top of the composition window be easy or anything? Sometimes I wonder about myself! Time for the third installment of my history. After this we can get on to more current stuff! Won't that be fun? Okay - in the last post I explained about how I learned to speak on the inhale. The doctor who gives me my Botox shots was very impressed with my "talent." He invited all of his interns and other doctors in to witness my inhalation voicing! What fun - to be the "stage show" in a doctor's office! Oh Well! As I said, my therapist got tough with me and demanded that I only talk on the exhale. After a couple very frustrating weeks where my husband could hardly hear me (it did mean that he had to sit much closer to me while we watched TV though! ), things with my voice started to click. Soon I could say entire sentences on the exhale One of my very first complete sentences on the exhale was - "I hate everybody and everything - except for you." The "you" is my husband who was listening to me talk at the time! As you can tell from that lovely comment - it was a rough road! With MUCH continued practice, I am now able to speak totally on the exhale. Most of the time I sound pretty much normal with the exception of my soft volume - I still can not yell or scream. Once in a while my voice starts "breaking up" and I have problems voicing words beginning with w, h, and p. That is when my therapist tells me to get much softer and slower. I have a problem with the slow part - I mean, I LOVE to talk and after not being able to do it for so long, I have a LOT of time to make up! If you would like to hear samples of my voice, check out my podcasts. The earlier posts are with me speaking on the inhale and the more current ones are on the exhale. Learning to Live With SD. When I am speaking one-to-one I am good. When I need to talk in a small group or in a noisy environment I use my Spokeman microphone. It is a personal amplification system which is very small and portable (I wear the amplifier on my arm like a MP3 player even though it is a bit bigger than a player.) and allows me to be heard without "pushing" and stressing my voice. I also have a phone which amplifies the outgoing voice and it really cuts down on my stress about being loud enough to be heard by the other person. I love my Spokeman and my phone! Once I figure out the entire picture thing I will put a picture of my microphone system and my phone on this blog for you to see. I got back from the doctor's a bit earlier than I expected so I have some time to Blog. It really is like an addiction! Let's see - I told you about medical disability . . . okay. I stopped teaching in January of 2007 and started really concentrating on my speech therapy. I became a therapy fanatic. I had a list of exercises (breathing, inhale sounds, etc.) from my therapist and instructions to do them four times at the least and once an hour optimally. I went out and bought myself a timer. That timer was set to 50 minutes and each time it went off - so did I! I ran through my list of exercises and then reset that timer. Sometimes it seemed like that darn thing ran my life! I would stop in the middle of almost anything (I didn't set it after seven in the evening to give myself a break!) and do my exercises. My therapist was very happy with my progress. Now I was able to do some simple words speaking on the inhale - while breathing in. From there we went to phrases and within a few months I could literally talk on the inhale. It took me a little more time and made my mouth extremely dry all the time but . . . I could talk! During this time my speech therapist and I continued to try the exhale (or "normal" voice) with no sucess. We agreed that maybe the inhale voice would be all that I would ever have so I kept practicing to increase my endurance. I would read outloud at least two to three hours a day and kept that timer going to remind me when to do the vocal exercises. About five months ago I noticed something weird happening while I was reading outloud. Every once in a while, a word would "pop" out on the exhale. Popping is literally what it felt like. I would be going along on the inhale and then - pop! - a word would come out "normally!" At first it was very unpredictable and I couldn't do it on demand. However, it became more and more frequent as time went on. Then I let my speech therapist know that words were popping. She decided that I should try to talk only on the exhale - something I hadn't done for a long, long time. I was very frustrated! Whenever I tried talking on the exhale things came out in a whispery voice which seemed to crack and fade in and out. What in the world was my therapist making me do? I sounded much better on the inhale and people could actually hear me! Some of them DID think I was mentally challenged but . . . .
That's all I have time for now. Today's post is going to be really short because I am off to a doctor's appointment. Nothing SD related - just giving blood for a checkup. I am fasting so I can hear my stomach growling as I type this! After the appointment I am meeting a friend for lunch and then heading to my American Sign Language class. I decided to take up ASL because using it I can still communicate with my husband when my voice is bad! I can also "talk" across the room to him which I can't do even on a good day with my voice. Now all I have to do it teach my husband the sign language! Who knows, maybe I will even use ASL to teach deaf children one day! It is a possibility! When you are a teacher without a strong, stable voice it can really limit your job possibilities! I am looking at some technology options and maybe some curriculum writing jobs but . . . who knows what the future will hold. Oohhhh. My stomach is really talking to me now! I can't wait until I am done giving blood so I can have something to eat. I am also doing some other test which requires me to not drink anything also - I feel as dry as if I were trekking across the desert! I hope you are not that thirsty or hungry while you are reading this post! Here it is -my second post on my new blog! I feel like a kid with a new toy! I was awake last night (not totally because of excitement over the new blog) thinking about what kinds of things I can write here! I can write all kinds of things! Maybe to start I should tell you a little bit more about myself and how SD became an integral part of my life. Let's see. . . . I grew up in Ohio and got married to a wonderful man who then took a voluntary transfer to Texas. I enjoy Texas most of the time but the summers are ridiculous! I mean I think 90 degrees is plenty warm - why go into the hundreds? That is just nuts! And even nuttier - there are actually people here who LIKE the hot temperatures! I wonder if there is a greater concentration of psychologists in Texas than in other states. I will have to look into that! Anyway - here I am. I am a teacher by profession and vocation. I have taught a total of 15 years and have enjoyed pretty much every year even though I have had my fair share of crazy supervisors! I love working with elementary age students because it is fun to see them learn and grow. My last assignment - which was my DREAM job - was teaching highly gifted fifth graders. These kiddos had IQ's of 140 or above so they really kept me on my toes. It was a super job - hard but way worth it! This job really suited me and my personality and I have no intentions of leaving for a while. THEN - I suddenly lost my voice. It started like the "beginning of the year voice" that all teachers get. They are not used to talking all day and their voice gets overworked and sounds a bit raspy. Normal. However, my voice went from raspy to whispery (I still wasn't too concerned because this also happens to teachers). Then, my voice just stopped - and I mean stopped. I couldn't talk AT ALL! Of course I pushed myself to try to continue talking enough to keep my class going. I also became very creative in ways to teach - the computer was a God send. I learned some basic sign language through books to communicate with the entire class when I couldn't whisper in someone's ear - which was the only voice I could muster up at all. During this time I was on anti-anxiety meds from the previous year when my principal was a psycho and I began having anxiety attacks. My primary care physician was certain that once I was no longer stressed, my voice would return. No such luck! I taught for about three and a half months with basically no voice whatsoever. This worked but was very stressful. I had my husband record the spelling lists to play for the spelling test. I had other teachers record things which had to be said out loud to the class. I typed hundreds of thousands of pages of text on the computer to project on the screen for the students to read as though it was me talking. The kids didn't mind - they seemed to think it was like a new challenge. They did pretty well with the whole system. It was me who was freaking out. I went to an ENT and was told that there was no damage to my vocal chords and little else. He sent me to a speech therapist who became my salvation. Susan, the therapist, has a lot of experience with SD patients and, after a couple sessions, she became positive that I had ABSD. We worked to relax the muscles around my larnyx which were basically frozen from months of me trying to force myself to talk. Then we went into exercises to correct my breathing - also messed up from forcing myself. Soon, I decided to take a leave of absence from my job to concentrate on therapy. I was confident that a coupld of months would make all of the difference and I would soon be back better than ever. WRONG! The couple of months turned into the rest of the school year and then into temporary medical disability and then I had to resign my position with the district because all of the leaves had run out. From my dream job to no job in a year. Not good! I guess I should give you a break and quit typing for a while. Tomorrow I will continue the saga . . . I decided to expand my technology "kingdom" to include blogging. I am hoping that this site will help spread the word about Spasmodic Dysphonia and help people with SD learn to cope with the disorder. I am basically going to try to update this blog regularly and just tell you what is going on in my life - which is always influenced by my ABductor Spasmodic Dysphonia. Some days are bound to be boring but, hopefully, other days will be relatively interesting! Learning To Live With SD is a podcast that I host on Podcastspot.com. I hope that you will check out the podcast also. If you would like to learn more about Spasmodic Dysphonia you can go to dysphonia.org - the website for the National Spasmodic Dysphonia Association. As a new blogger I am always open to helpful hints about blogging so - if you have any wonderful hints for me - let me know! In January 2007 my entire life changed. Well, it was a bit before that but, in January 2007 I was diagnosed with ABductor Spasmodic Dysphonia (ABSD). I was basically without a voice for over a year until I learned to speak again with the help of a wonderful speech therapist. Now I am continuing my dance with ABSD while finding new avenues of communication. Currently, I am working towards becoming a certified American Sign Language Interpreter. How Am I Doing With My Routines? Some of My favorite Words! Q-Tip, we will always love you!